Gold Magic: Archer uses this magic to create and manipulate gold. The King's Treasure (王の財宝ゲート・オブ・バビロン , Ō no Zaihō): With an open grimoire and the use of Bab-ilu, the user connects the space of reality to Bab-ilu's dungeon vault, opening an "invisible door" that allows for the contents to pass through upon the user's command. Among the contents of the treasure room are various weapons made of gold, which allows a user of gold magic to repair them if they are broken. 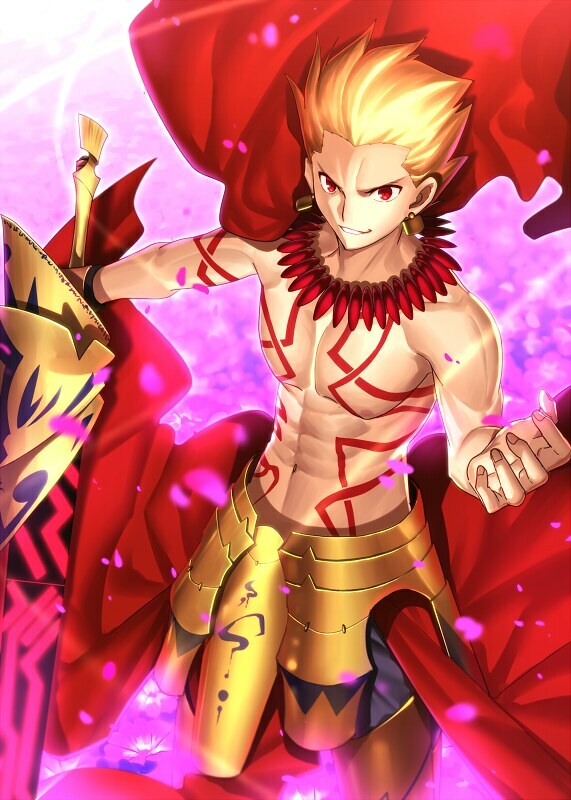 In the hands of Archer, The King's Treasure has become an endless supply of tools (magic and non-magic) and weapons, limited only be his skill and ability to keep the gate open. Sword of Rupture, Ea (乖離剣・エア, Kairi Ken - Ea): The strongest tool pulled from the treasure room. It has an abnormal shape that doesn't match what would normally be classified as something specialized like a sword. It is something that was born before the appearance of the concept that the world calls a "sword", so it is not something that can truly be called a sword or have the shape of any known blade. While it has a grip, handguard, and is the same length as a longsword, the section that should contain a blade deviates from the normal form of an edged weapon. The "blade" itself and the tip of the sword, spun in a spiral shape, are dull. It has the shape of a cylindrical, drill-shaped pillar made up of three independently rotating segments engraved with crimson cuneiform lettering that spin slowly in alternating direction like querns, the middle segment spinning clockwise and the top and bottom segments spinning counterclockwise. The drill design was modeled after bedrock excavators used to drill underwater tunnels. Its power derives from the treasury itself. Ea's strength is always a direct representation of the total worth of the treasury. The higher the value of items in the treasure room when Ea is in use, the more powerful Ea's offensive and defensive capabilities become. Key of the King's Law, Bab-ilu (王律鍵, バヴ＝イル, Ō Ritsu Ken, Bavu-iru): A golden key-shaped sword that connects to a dungeon treasury, implied to be able to open any door so long as it has a lock.